John Smith, owner of Central Arkansas Beekeepers Supply in Russellville, first learned bee keeping from his father when he was a young boy. “My dad would extract honey from wild bees,” he explains. “Later he turned to keeping them in captivity. World War II was the only time he didn’t keep them,” John adds. John took up caring for the bees in adulthood after his father was unable to take care of the apiaries. He quickly realized there was no local supplier for beekeepers. So he and his wife Corrine opened the store in 2011 and it has been growing ever since. They recently relocated to a larger location at 109 Warehouse Row in Russellville. Central Arkansas Beekeepers Supply share a close relationship with Rural Route Farms, a business which sells bee nucs. Bee nucs consist of a laying queen that is already accepted by the hive and five frames: three frames of brood in varying stages, one frame of nectar and/or pollen, and one expansion frame that allow for a possible burst of growth brought on by a nectar flow. Bee nucs can be delivered to the store for anyone wanting to start their own hives. Over the years the Smiths have created a living resource for the community, an interactive store and online shop where people can make bee keeping a success regardless of how new they may be to it. “You’re not alone in this,” John says. “ I’m here, just a phone call away.” He says he loves how modern technology allows beekeepers to trouble shoot and support one another. “A person can take a picture of their hive and text it to me, and I can tell him what’s going on,” John says. The store also showcases a wide array of gift items for that bee lover in your family and every customer is greeted at the door with a welcome smile and an offer to help customers find what they’re looking for. In many ways the store also serves as an advocate for bee keeping and honey bee preservation, John says people often come into his shop and choose to get into bee keeping to help our decreasing bee populations. “Without pollination,” he explains, “we loose our food supplies.” He recommends that anyone interested in keeping bees make sure they invest in a good quality book and get set up with a club and a mentor who can help the beginning keeper with any problems that might arise. “Anyone can keep bees,” he adds. 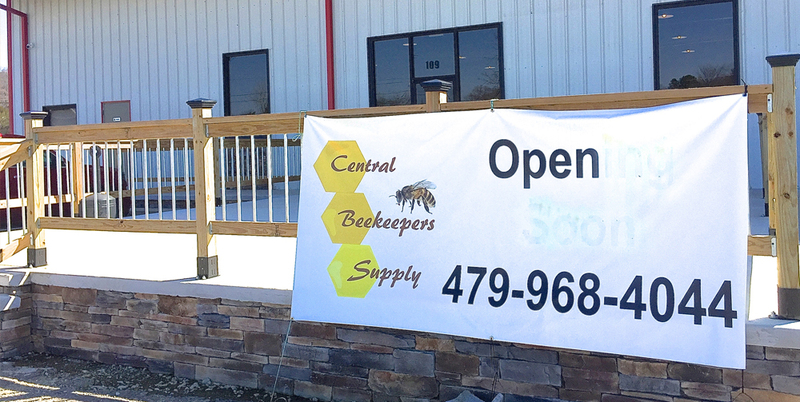 Central Arkansas Bee Supply is open five days a week: Tuesday through Friday 10 a.m. – 5 p.m. And Saturday 9:30 a.m – 3:30 p.m.You can also view their selection and order online at www.centralbeekeeperssupply.com While you’re there you can learn more about upcoming events in the bee keeping community, including free beginning bee keeping classes.